We need some Foothills folks to volunteer to help Rodney Tumlin and his North Paulding High School Fly Fishing Club. Unicoi Outfitters is hosting the group on Sunday afternoon, December 6th at Nacoochee Bend. Rodney will probably bring along several advisors but it would be good to have some of our local folks help who know the river well. This group is sponsored by Cohutta TU. Please check out the event below and let Rodney know if you can help on Sunday, December 6th at Nacoochee Bend. TU Member support needed next Tuesday, Nov 17, at the Helen City Council Meeting at 3pm. There will be discussion on the cleanup of the Chattahoochee River that the City of Helen seems to not favor. Trash from the city and Tubers often accumulate down stream with no concern from the city for cleanup. Please attend if you can to help support those trying to get the City to take action. Meeting is at City Hall up on the hill in Helen. 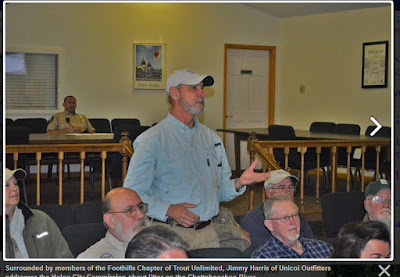 The chapter of the Healing Waters that is led by the GA Foothills and Gold Rush Chapters of TU held a fishing event for the Veterans at the Nacoochee Bent with support from the Unicoi Outfitters. Our November monthly meeting will be held at the "Hog Wild" Restaurant in Clarkesville. Dinner and social time begins at 6pm with meeting starting at 6:30pm. The chapter shirts will be ready for pickup at the meeting. Anyone who ordered one (or more) will need to be prepared to pay for them. 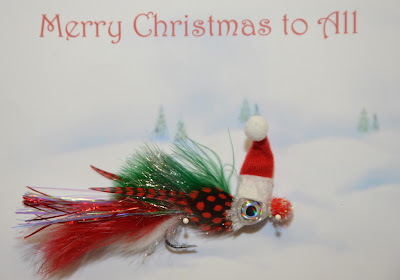 The owners of Tuckaseegee Fly Shop in Bryson City, NC will present our program at our next meeting, Thursday Nov 12. Dale Collins and Bobby Bennett will speak with us about their shop, guide service and fishing opportunities in the area.